No. 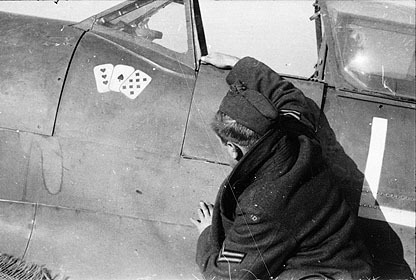 318 Squadron Picture Gallery. 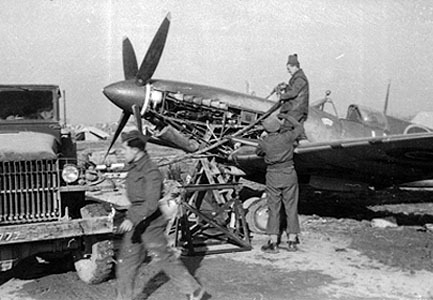 "Forli"
On 27 December 1944 while at Folri, the squadron was visited by the official newspaper and newsreel correspondents from the Polish Corps and by Americans from movie industry. Some shots of No. 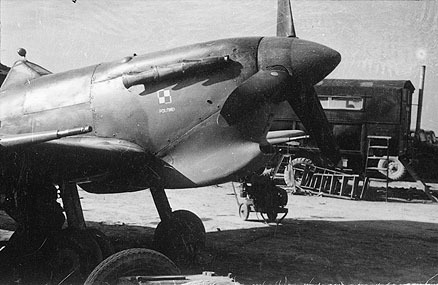 318 (Polish) Squadron and No. 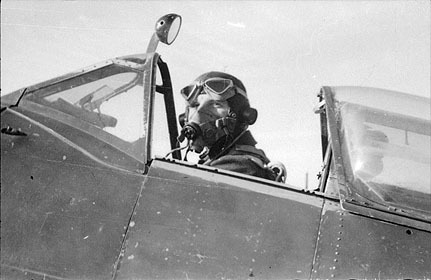 40 Squadron of SAAF were made. 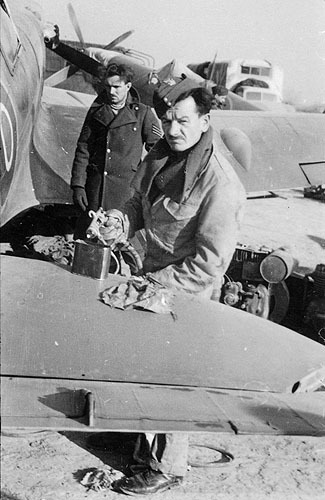 Above: On of the unit's Spitfire Mk IX in capable hands of the ground crews. 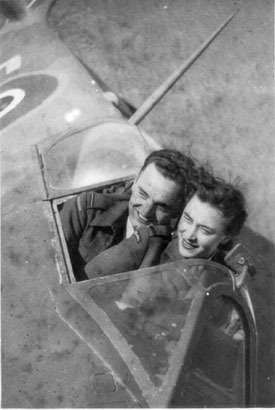 Left: The same aircraft as above Center: F/O Gaworski enjoys a the moment. 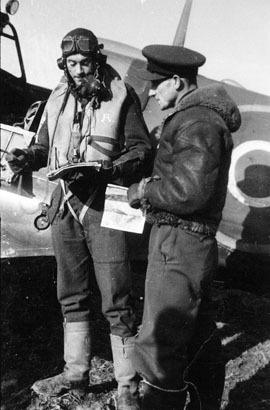 Right: F/O Radwanski (left) and F/Lt Galicki before the ops. Spitfire MkV, LW-F, ER123 getting a paint job. Left: Another view of ER123. 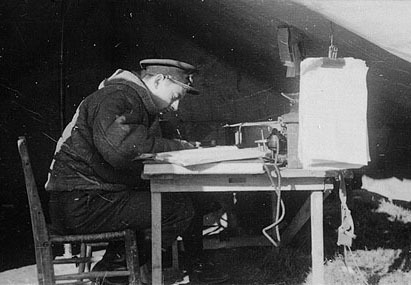 Right: F/Lt Kon at the operations. Forli. January 1945. 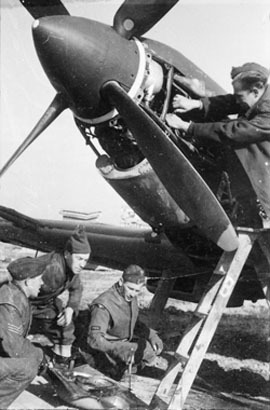 Flight "A" with mechanics. First from left: Stefan Kalita (with dog), Stefan Knapp, Henryk Rosinski (between, standing), Zdzislaw Uchwat, Wincenty Miniszewki, Jan Preihs, Zbigniew Kalinowski, Jerzy Paczuski, Wladyslaw Nycz, Jan Slusarski and Mieczyslaw Sawicki. 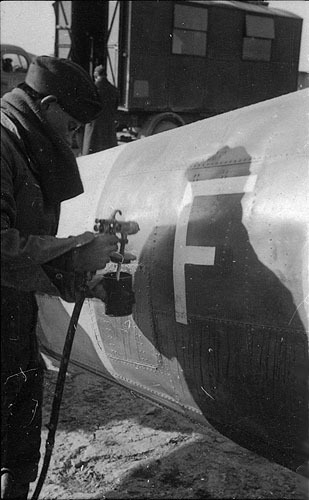 Forli, February 1945. 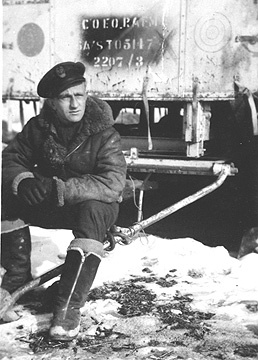 Left: The squadron's CO, S/Ldr Moszynski. 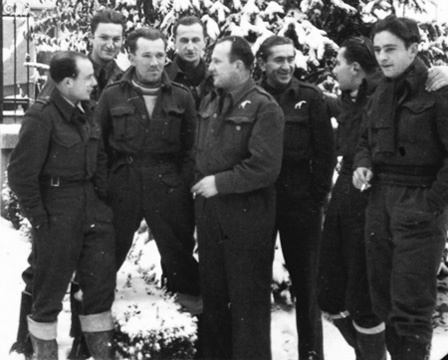 Right: Dusiacki (left), Kosmalski, Uchwat, Nycz, Kalinowski, Rosinski, Paczuski and Kon. Forli. April 1945. 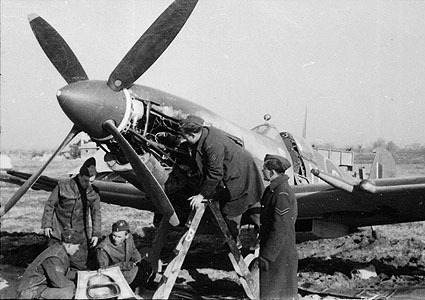 So.....Spitfire had no floats; recovery crew had work.